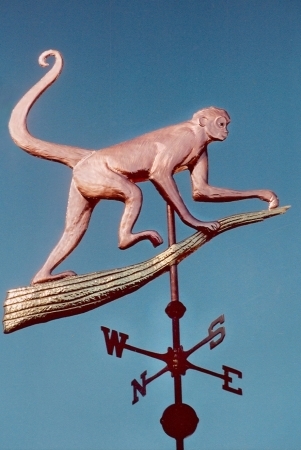 This Spider Monkey Weathervane is handmade from copper, with details such as musculature and pelt texture captured in our fine tooling on the copper. The branch under the Spider Monkey is enhanced by optional gold leaf accents. You can request additional optional gilding to draw attention to other individual details as well. The eyes are glass and come in a wide range of colors for your selection at the time of your order. This commission came from a couple in Texas who enjoyed scuba diving vacations throughout the Carribean. They built their home with tropical styling and included a cupola for one of our weather vanes, but it was five years before they were sure what they wanted. It was on a holiday that they took an exceptional and lucky picture of a spider monkey walking a branch in the canopy of the Guatamalan jungle. When they got home and saw it again, they knew what their weather vane had to be! These gangly and quite enchanting animals are native to jungle canopies from Mexico to Brazil. Our artisans have created personal specialized hammers to render the textures of many different furs, branches, and leaves. We are so pleased with the results here. If you have a variation on this monkey you would like us to consider, please call or email. Creating individualized weathervanes is our favorite pursuit, and every vane in our extensive array began as a special commission.